Giving Room to Rivers usually refers to allowing higher waters to spread out onto a rivers’ floodplain. In Rising Tide, John Barry describes what is effectively the opposite of “Room for rivers” –a channel confined by dikes and levees. How do you give room to a river? In many places, we’ve already altered the natural course and flow regime of rivers for navigation, economic, agricultural, and residential development, hydropower, and flood protection. In California, for example, the hydraulic mining (gold rush) legacy intended to maximize scour left the landscape with narrow river channels cut off rivers from floodplains between high levees (Mount 1995). How do you give room to a river then in a landscape that’s been altered? Diverting water away from the main channel (bypass) and urban areas or critical infrastructure, and into less developed lands in a controlled manner. This is done through some type of opening in the levee. Paradise Weir diverts water off the Lower San Joaquin (up to 18,000cfs) into Paradise Weir in 1998. Image Credit: Mike Archer, MBK. Designating overflow areas (often on agricultural land with compensation) to retain flood peaks (high water) until water levels in the main channel drop. This is sometimes called transitory storage. Where might it be appropriate to give a river room? In bottlenecks in a system, and also areas upstream of critical infrastructure or dense population centers. Reducing water surface elevations in these areas, or routing water around them all together, reduces the risks from flooding (probability and consequences) in these areas. It is much easier to give rivers room along less developed lands than in developed areas. 1-Reducing water surface elevations (Figure 1 above) reduces the probability of levee failure by overtopping. For example, on a given project, the discharge previously associated with 150-year return period might become a 300-year return period (unpublished study). 2-Reducing water surface elevations reduces the probability of levee failure due to geotechnical failure mechanisms. 3-Reducing water surface elevations reduces the consequences of flooding because damage and loss of life are a function of flood depth . 4-Reducing water surface elevations reduces the consequences of flooding because water on a wider floodplain rise more slowly and this increases warning time. Communities downstream would have time to safely evacuate to higher ground and to move valuables out of harms way. In contrast, in a narrow channel, high waters are confined by levees that can fail suddenly, flooding the land they once protected catastrophically allowing no time for evacuation. 5-Reducing water surface elevations reduces the consequences of flooding because floodways and bypasses can route high, fast moving floodwaters away from urban areas and critical infrastructure and into less developed lands where damage to human life, massive highway, water supply, power, or other infrastructure is not as large a concern. (See MR & T project–Spillways averted disaster in urban areas of Cairo, Baton Rouge, etc.). 6-Designating overflow areas ahead of time (often called transitory storage) again reduces consequences because managers can control the location, timing, depth, and duration of a flood in a specific area (like a prescribed forest fire). Whereas levees left to overtop or fail on their own, often do so in an uncontrolled manner. Floodplains are some of the most productive ecosystems in the world because they can regulate temperature, filter water, provide more complex habitat and refuge for fish, etc that are not otherwise present in the main channel. They also surpass many purely aquatic and terrestrial ecosystems in primary productivity. Though benefits will vary by species, in general floodways like the Yolo Bypass have proved to be very beneficial to fish, birds, and other aquatic species. 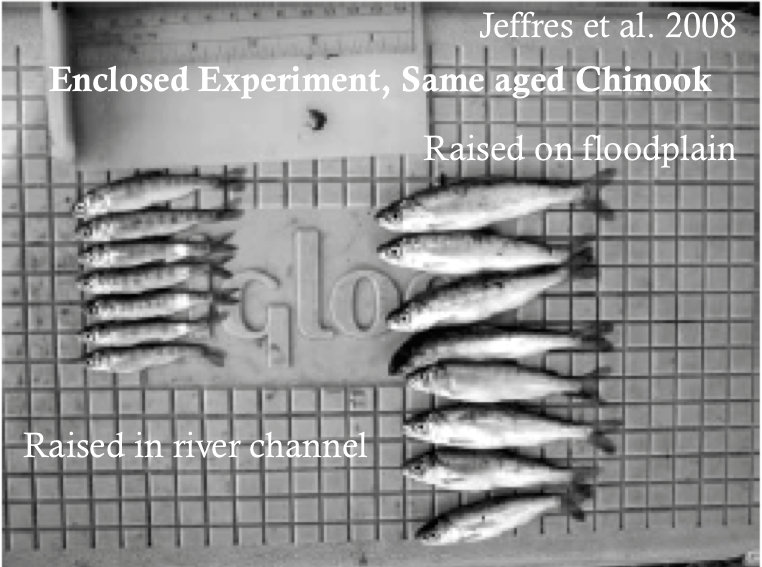 One study on the Cosumnes river showed fish raised on the floodplain grew three times as fast as fish that were raised in the river channel below the floodplain. Floodplain restoration can have important water quality benefits as well including turbidity, sediment, and temperature regulation. See resources at the end for good articles on the benefits of floodplain reconnection. Giving room to rivers below reservoirs allows for more flexibility in reservoir management which can improve water supply reliability. For a simplified explanation, reservoirs in California are managed for two conflicting purposes: Water supply and Flood Control. A full reservoir is good for water supply because it can store water for use in the drier months. In California’s Mediterrannean climate (wet winters, dry summers), this is key to the state’s agricultural industry as well as the support of larger urban areas. An empty reservoir, on the other hand, is good for public safety because it has space to capture heavy precipitation events to protect communities downstream of the reservoir from flooding. 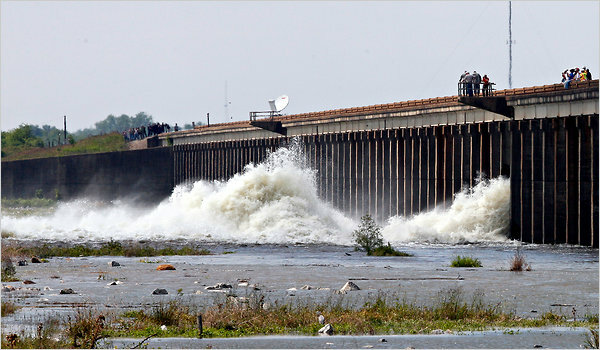 If a storm occurs while a reservoir is full, there is no space to capture the precipitation or and reservoir operators will have to release excess water to avoid overtopping the dam. Because many communities are currently downstream of the reservoir, operators cannot safely release water in this situation without significant risk to public safety and property. This is partly what happened in last year along the Souris River in Minot, North Dakota. Enlarging a floodway below a reservoir allows more water to be released safely without threatening downstream communities. Therefore, enlarging a floodway below a reservoir also allows operators to store more water for the dry season. This concept is also discussed in the Delta Vision Strategic Plan (Strategy 5.2). Many such projects on multiple scales exist around the world, but I mention just a couple here–with which I am most familiar. The Yolo Bypass (first proposed by William Hammond Hall), was built by the U.S. Army Corps of Engineers in the early 1900s in order to reduce the frequent flooding in the Sacramento Area. 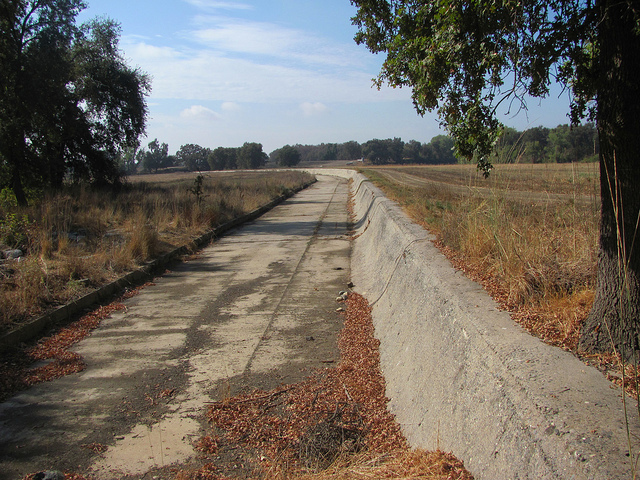 It was component of a greater vision of floodways and bypasses for the Sacramento Valley that was never fully realized. During high flows when the river gauge is at 33.5 feet (10.2meters), the Yolo Bypass takes water off of the Sacramento River at the Fremont Weir and spills it into a 59,000- acre floodway. 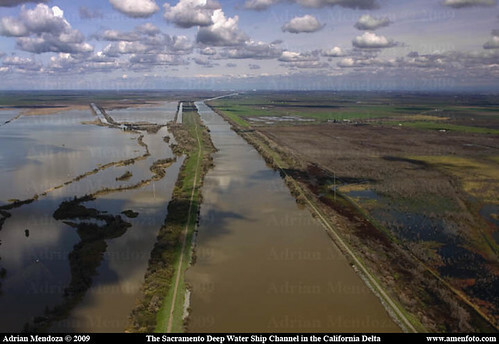 For 80 years, the Yolo Bypass has kept the Sacramento area dry by routing floodwaters around the urban area of Sacramento and into less developed wetland and farmland, where farmers are compensated. 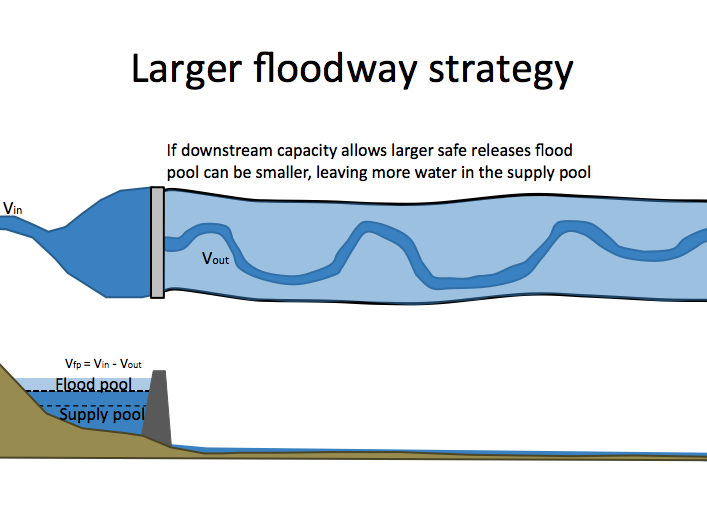 The bypass can convey upto 80% of the flows from the Sacramento River, roughly 480,000 cubic feet/ second (13,500 cubic meters/sec), which is equivalent to a flood on the Sacramento with a 1/100 year recurrence interval. Followed by one of fremont weir and bypass wet. The bypass also supports a 16,000 acre (6,500 hectare) wildlife area. It is inundated about every 2-3 years to provide ecological benefit, and studies showed it provides seasonal habitat for at least 40 fish species (including some threatened/listed ones like the Delta Smelt). There has been recent discussion of expanding the bypass. In May 2011, the midwest experienced extreme flooding and the US Army Corps of Engineers activated three floodways along the Mississippi River in response to high water levels (A plan from 1928 after the first Great Flood). The first floodway, called the Birds’ Point- New Madrid Floodway was to be inundated when water levels reached 61.5 feet (18.7 m) at Cairo, Illinois. The levee would be intentionally breached, diverting flood flows off of the main channel (see figure 2 below) and (back) onto the floodplain. It is estimated to convey 550,000cfs (15,600cms) through the floodway and to reduce flood stage by 7 feet (2.1 meters) at Cairo. With about 90 landowners in 133,000 acres (53,800 hectares) affected in the region (in red), the decision was somewhat controversial– though in court, the judge defaulted to the original plan from 1928. 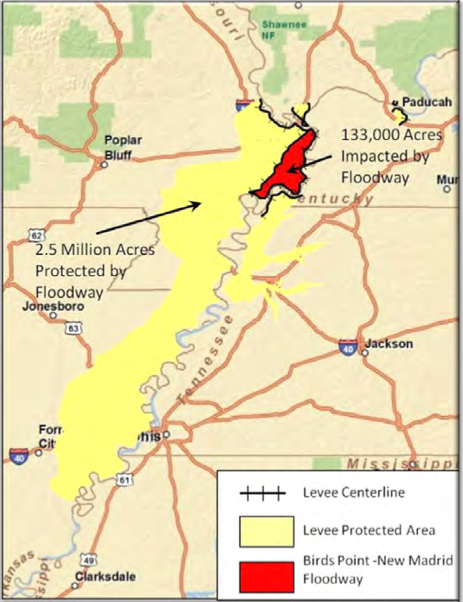 Yellow shows the 3,000 people in Cairo, Illinois were protected by the floodway along with some 2.5 Million Acres (1,011,000 hectares) of farm land. Further, personal communication with US Corps of Engineers personnel mentioned farmers within the floodway were compensated financially and some were able to get in a crop of soybeans this year. 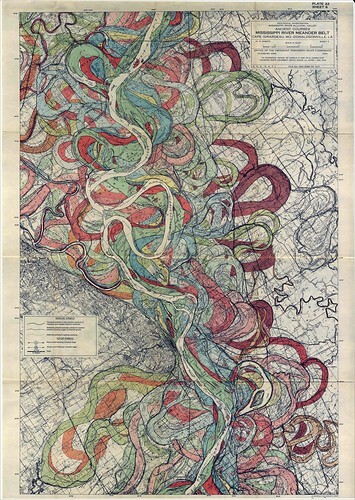 For more information: read the Original Plan and history of the Mississippi River and Tributaries Project. 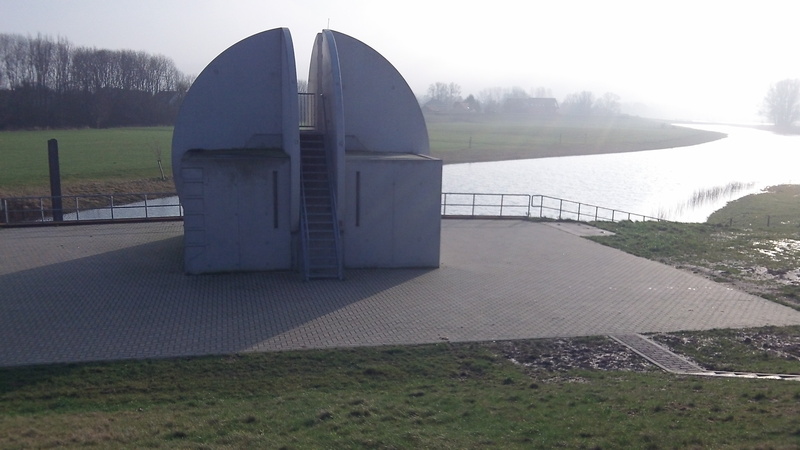 The first of 39 “Room for the River” projects on the Dutch river system in the Netherlands was completed in January 2012 near Westervoort (closer to Arnhem). The €30 million project is key in maintaining water distribution at the Rhine River bifurcation (splittingspunt) where the Neder-Rijn (Lower Rhine) takes about 2/3 of the discharge and IJssel River takes about 1/3 during high waters. Intended to improve public safety, Hondsbroeksche Pleij “reclaimed” 120-hectares of former floodplain on the right bank of the Neder Rijn. At maximum, the project is expected to reduce water surface elevations by 40cm (1.31 feet) though there is some discrepancy (personal communication, unnamed engineers) about the actual reduction given the uncertainty is ±20 cm. A new setback dike 2.6km long (called the Pleijdike) was constructed roughly 250 m inland to expand channel capacity. Higher water can also be diverted into the recently excavated hoogwatergeul (labeled “bypass”) as a temporary storage area using a 150 meter adjustable weir structure. Bypass here is not as we use it in the US– in this case it represents a high-water storage area. 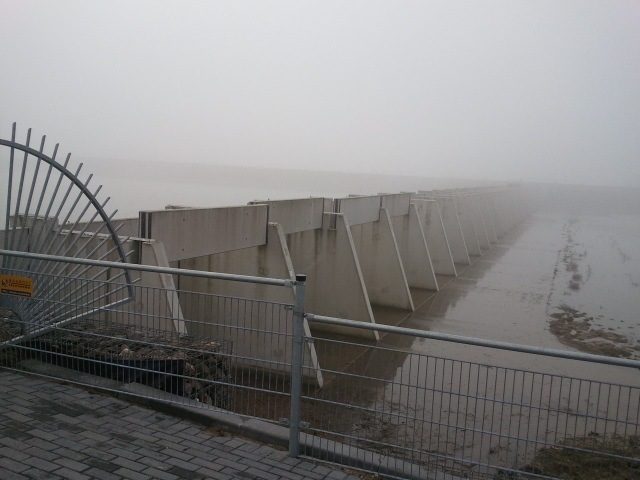 Up to 660 cms (23,300 cfs) can be diverted off of the Rhine during high high waters. The weir has 30 gates and is “manually” adjustable depending how much water they want to divert into the floodplain. The last component of the project was a seepage channel behind the new dike (because high water can encourage seepage) and a pump to remove the seepage water. For now the project serves mainly public safety and has a nice walking tour around the area. But ecological benefits at Hondsbroeksche Pleij could likely be achieved with more frequent inundation of the floodplain during certain times of the year (depending on which species they hope to benefit). But as of now, the floodplain is expected to be inundated only at extreme high water– about 10 days/year. The following video (in Dutch) describes the project. It is still worth a look for a nice visual simulation of using the weir to activate the floodplain. I apologize that the graphics don’t really do this project justice. I’ve struggled to find some which show better how it functions and I’ll post them when I come across. Common functions: these projects reduce flood risk by giving rivers more space to spread onto floodplains. Common barriers to implementation: Land acquisition, multiple stakeholders, constrained budgets, construction costs, and infrastructure relocation. Scale: Where as the Dutch project conveys 23,000cfs, the Yolo Bypass has a capacity of 480,000 cfs and the New Madrid 550,000 cfs. See also the City of Napa’s bypass channel through downtown for a smaller-scale example. What this shows though is that these projects can be implemented at multiple scales. 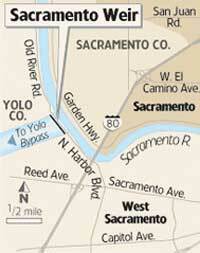 Ecological Benefit: The Yolo Bypass is the only example above with real ecological benefit. (As in, the benefits have been assessed and the project has explicitly a group working on the ecological side of things.) Dutch projects to date add “spatial/scenic quality” as an after thought and I’m not aware how much research (at this moment) goes into ecosystem restoration before hand. Given most of the 39 projects have not yet been built, it is still a possibility to design them with this in mind if ecosystem restoration becomes a true priority. Political barriers to implementation: A national Dutch effort and interest behind Room for Rivers appears to make Room for Rivers more “feasible” in the Netherlands than in the United States for a few reasons (that each deserve their own article). 1- It could be related to the 1% of Dutch GDP that goes toward managing water compared to…(I don’t know the figure in the United States). 2-Further, the Dutch have a national interest in keeping their feet dry because so much of the country is flood prone. In the United States, flooding is largely a local/geographical issue (despite that paying for flood damages becomes national), and as such, it has can be more difficult to muster the financial and political support for certain types of projects given many of the taxpayers won’t’ see the immediate benefits. Public Awareness and Support: Though the Dutch are not the only ones to give room to rivers, the Dutch government has done an excellent job branding the Room for the River program all over the Netherlands and abroad. Through great visitors centers, television shows, and short videos, the Dutch have educated their public about the benefits of such a program, and simultaneously instilled a sense of pride, understanding, and support for the projects. Specific habitat needs in room for river projects including hydrologic regime (time, depth, duration, temperature, etc). 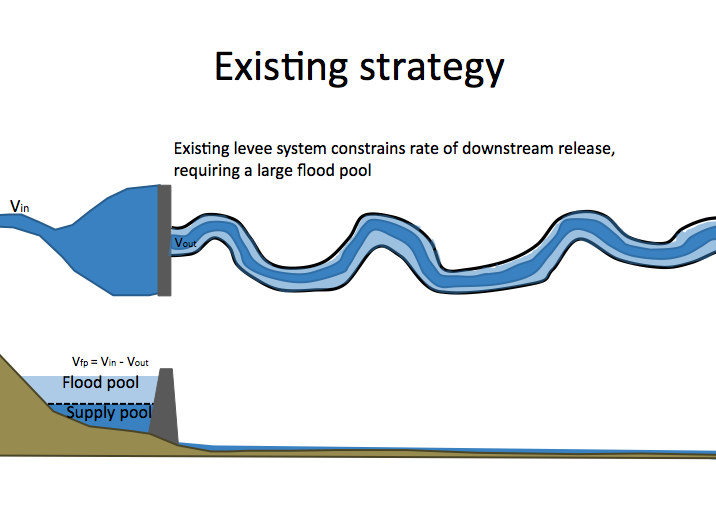 Possible self-mitigating projects: given constructing levees would require environmental mitigation anyway (in the United States), floodplain restoration in the project could create the ecological benefits needed compensate for the environmental “damage” in the project. Expanding capacity could provide more flexibility over the long term for adapting to climate change. A note about, structural vs. non-structural vs. technical vs “natural” vs…? What’s in a name? These types of projects are often described using words like “non-structural” flood protection–(as opposed to “structural”) despite that many such in fact still rely on structures–like gates, set-back levees, and weirs. Promotors of Room for Rivers might consider de-emphasizing a “non-structural” or “natural” buzz word and instead focus more on the multiple benefits provided by these measures. California Department of Water Resources (access 2012). Beneath the Flood. Jeff Mount, (2011) The Benefits of Floodplain Reconnection. This entry was posted in Ecosystem Function, Flood Risk Management, Uncategorized and tagged floodplain, great flood, levee, room for river, structural flood protection. Bookmark the permalink.